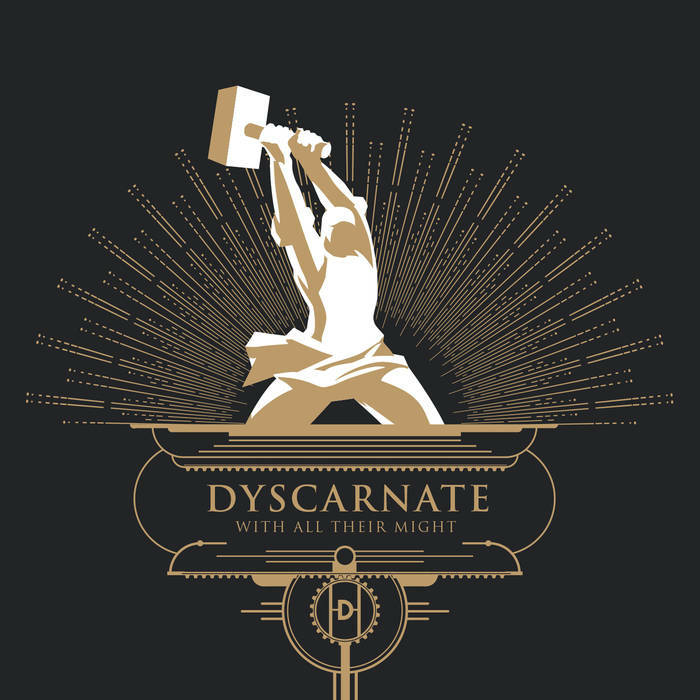 Dyscarnate are a UK death metal band and this is their third album. Dyscarnate play heavy, modern, aggressive death metal. With All Their Might in general can probably be described in a cursory fashion as a mix of Deicide, Job for a Cowboy, Kataklysm, and Decapitated, although this is only a starting point and there’s a lot more to this album than this might lead you to believe. This is a refined, sleek, lean assault, devoid of unnecessary flab or filler. The songs all go for the kill in an efficient and professional manner. That doesn’t mean that the music is overly simple or lacking in substance though, as there’s more than enough meaty content in the tracks to satisfy and please. There’s a lot of pit-friendly groove-heavy material here, alongside the obligatory blast beats and general death metal carnage. All of it is performed extremely well though, and these are well-crafted, enjoyable songs. They also have a large quota of catchiness and memorability, increasing the replay value considerably. Infectious riffs, well-considered melodies, and some interesting compositional ideas and enhancements all help the songs come alive, and their brutally realised aggression is a joy to hear. Each song makes its own impression, and each of the eight tracks on With All Their Might has its own flavour and character. I like an album that feels well-structured and flows easily from one track to the next, with each song being notable in its own right; this is exactly one such release. The dual vocal assault of deep, efficient growls and sharp, dangerous screams is a great combination, bringing to mind in places Deicide at their best. Other vocal styles do unexpectedly appear though; not often, but they perk up the ears when they do. With a sterling, gleaming, professional production to round things off, With All Their Might is an extremely strong death metal album that has the worthy distinction of sounding a fair bit more individual and characterful than a lot of ones out there. This entry was posted in Death Metal and tagged Death Metal, Decapitated, Deicide, Dyscarnate, Job for a Cowboy, Metal, Modern Death Metal. Bookmark the permalink.